Media | Drum to the Beat! Here are some materials to assist you in promoting your Drum to the Beat event. Download a 11 x 17 poster with space at right for you to add your event information. 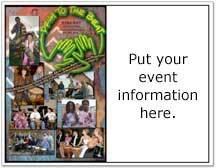 Download a 8.5 x 11 poster with space at right for you to add your event information.